If you want a great looking automotive website template, you have come to the right place! 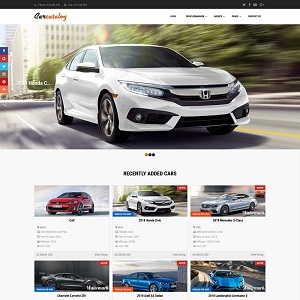 Car Catalog is a great Joomla template for car dealership websites, auto classified ads websites, car rental websites, car repair and highly suitable for all other vehicle related businesses. You can also use this car dealer website design for showcasing used cars, trucks, bikes, bicycles, motorhomes, tractors and other types of vehicles. The template includes fully ready website package, based on Joomla 3.8 and Vehicle manager PRO - car dealer website software for car rental and sales. With Vehicle Manager you'll get necessary features for vehicle management - backend and frontend submission forms, contact agent forms for requests on rent and purchase, system of reviews and ratings, email notifications and much more. Quickstart package will help to install fully ready website with template, components, modules and dummy data in just minutes. Car Catalog has a responsive design, that's why your site will equally look great on both desktop computors and mobile/tablet devices. Also it has a lot of customization options thanks to Joomla Blank template integrated. Fonts and link style, body color and pattern, links on social accounts, copyright and Google Analytics code can be customized with ease. Plenty of module positionsDue to Joomla Blank template, Car Catalog comes with a wealth of module positions to place your content exactly where you want it. Cross-Browser CompatibilityCar Catalog Joomla template fully compatible with all browsers: Chrome, Firefox, Safari, Opera and Internet Explorer 9+.